Detroit has long been a city in trouble but living across the river in Windsor, ON, from 1969 to 1977 left me with a great fondness for the sad old place where I covered political gatherings and peace demonstrations, reviewed plays, shows and concerts, and had great times with friends at theaters, clubs, bars and restaurants. Memories remain vivid: My first baseball game at Tiger Stadium. Great plays at the Fisher Theater but also a marvelous David Bowie concert there. The Doors at Cobo Hall. Elvis at the Olympia. Tim Hardin at the Purple Onion. Jaunts to Ann Arbor to hit the record stores and see Elton John and Creedence Clearwater Revival at the University of Michigan. Not to mention shopping in Hudson’s department store, great meals in Greek Town, lunchtime interviews at the London Chop House, dinners at Joe Muir, jazz on the terrace at the Hotel Pontchartrain, and burgers at the old Checker Bar on Bates Street downtown. 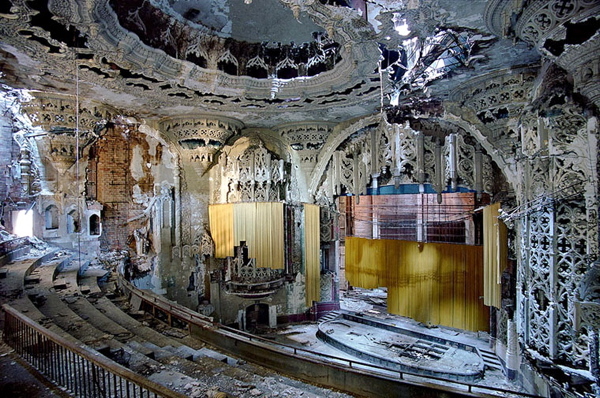 The sad beauty of Detroit’s modern decay has been caught in a series of photographs by Yves Marchand & Romain Meffre from France. The one above is of the United Artists Theater at 150 Bagely Street downtown, which opened on Feb. 3, 1928 with the film “Sadie Thompson” starring Gloria Swanson. It had a rocky career, though, and from 1978 to 1983 it had a brief life as the Detroit Symphony Orchestra’s recording theater. Then abandoned, the theater’s marquee was removed and its exterior was given a lick of black paint ahead of the 2006 NFL Super Bowl and the graffiti was removed from all the windows of the building but it remains empty. At the beginning of the 20th Century, the city of Detroit developed rapidly thanks to the automobile industry and until the ’50s, its population rose to almost 2 million people. At this time, it was the 4th most important city in the United States. During the ’60s, disindustrialization and violent riots caused a large migration of the middle-class people outside the metropolis area. Then until the end of the ’90s, “Motor City” lost more than half of its population. Today, despite a beginning of revitalization, a lot of the luxuous hotels, theaters, apartments, stores and office buildings built in the prosperous era remain vacant. This entry was posted in Notes, Places and tagged Checker Bar, Cob Hall, Creedence Clearwater Revival, David Bowie, Detroit, Detroit Greektown, Elton John, Elvis Presley, Fisher Theater, Hotel Pontchartrain, Joe Muir, London Chop House, Purple Onion, Romain Meffre, Tiger Stadium, Tim Hardin, Time, Time Magazine, United Artists Theater, University of Michigan, Yves Marchand. Bookmark the permalink.